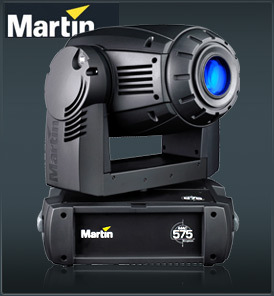 The Martin MAC 575 Krypton combines super efficient optics for brighter output with outstanding gobos and colors, together with MAC’s market-proven, modular construction. It is suited for stages, venues or any space that demands reliable, low-maintenance and no-nonsense performance. Total heat dissipation (calculated, +/- 10% at 230 V, 50 Hz): 2800 BTU/hr.